The low level of farmers' income and year to year fluctuations in it are a major source of agrarian distress. This distress is spreading and getting severe over time impacting almost half of the population of the country that is dependent on farming for livelihood, said a Niti Aayog policy paper. Persistent low level of farmers’ income can also cause serious adverse effect on the future of agriculture in the country. To secure future of agriculture and to improve livelihood of half of India's population, adequate attention needs to be given to improve the welfare of farmers and raise agricultural income, said the policy paper “Doubling Farmers' Income- Rationale, Strategy Prospects and Action Plan”. It said that achieving this goal will reduce persistent disparity between farm and non - farm income, alleviate agrarian distress, promote inclusive growth and infuse dynamism in the agriculture sector. Respectable income in farm sector will also attract youth towards farming profession and ease the pressure on non-farm jobs, which are not growing as per the expectations. Doubling farmers' income by 2022 is quite challenging but it is needed and is attainable. 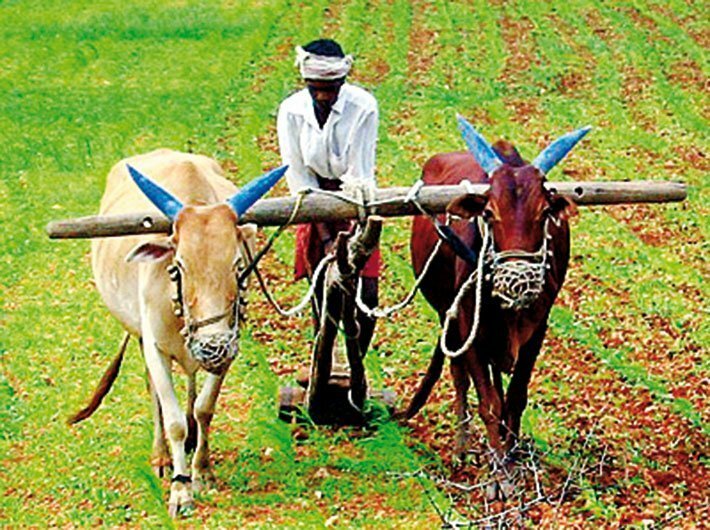 Three pronged strategy focused on (i) development initiatives, (ii) technology and (iii) policy reforms in agriculture is needed to double farmers' income. The rates of increase in sources underlying growth in output need to be accelerated by 33 percent to meet the goal. The country need to increase use of quality seed, fertiliser and power supply to agriculture by 12.8, 4.4 and 7.6 percent every year. The policy paper said that area under irrigation has to be expanded by 1.78 million hectare and area under double cropping should be increased by 1.85 million hectare every year. Besides, area under fruits and vegetables is required to increase by 5 percent each year. In the case of livestock, improvement in herd quality, better feed, increase in artificial insemination, reduction in calving interval and lowering age at first calving are the potential sources of growth. It exhorted research institutes to come up with technological breakthroughs for shifting production frontiers and raising efficiency in use of inputs. Evidence is growing about scope of agronomic practices like precision farming to raise production and income of farmers substantially. Similarly, modern machinery such as laser land leveller, precision seeder and planter, and practices like SRI (system of rice intensification), direct seeded rice, zero tillage, raised bed plantation and ridge plantation allow technically highly efficient farming. However, these technologies developed by the public sector have very poor marketability. They require strong extension for the adoption by farmers. R&D institutions should also include in their packages grassroots level innovations and traditional practices which are resilient, sustainable and income enhancing. The policy paper went on to say that such shift requires interdisciplinary approach to develop on knowledge of all disciplines. About one third of the increase in farmers' income is easily attainable through better price realization, efficient post-harvest management, competitive value chains and adoption of allied activities. This requires comprehensive reforms in market, land lease and raising of trees on private land. Agriculture has suffered due to absence of modern capital and modern knowledge. There is a need to liberalise agriculture to attract responsible private investments in production and market. Most of the development initiatives and policies for agriculture are implemented by the states. States invest much more than the outlay by the Centre on many development activities, like irrigation. Progress of various reforms related to market and land lease are also state subjects. Therefore, it is essential to mobilise states and UTs to own and achieve the goal of doubling farmers' income. If concerted and well-coordinated efforts are made by the Centre and all the states and UTs, the country can achieve the goal of doubling farmers' income by the year 2022.